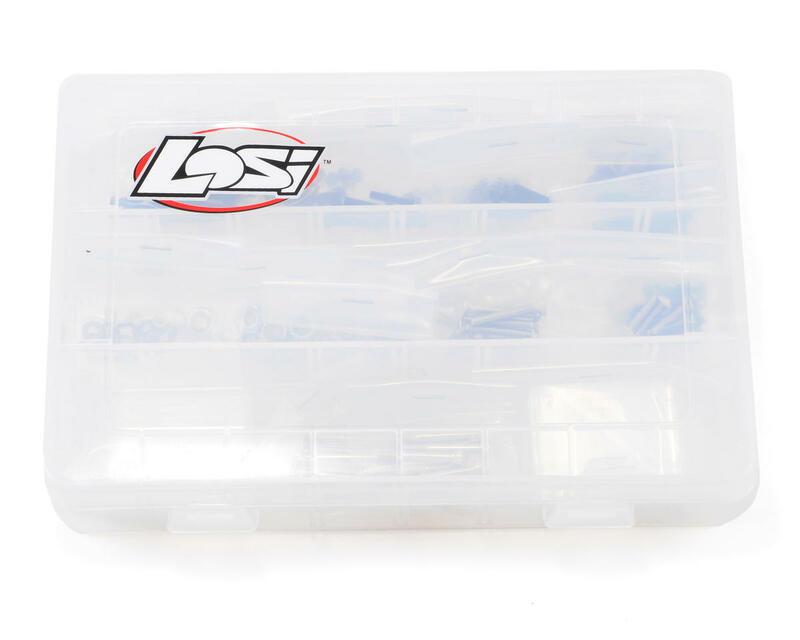 This is the Losi EIGHT Screw and Nut Assortment Box. Although all of the hardware used on the 8IGHT and 8IGHT-T is available separately, it never fails a part is needed here and there. 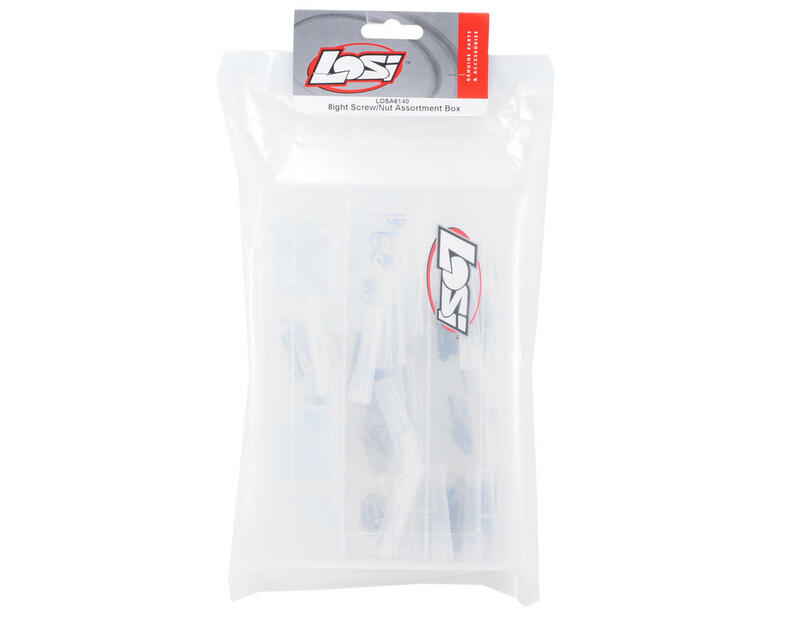 Since we all know you can never have enough spare hardware, Losi has put together a comprehensive assortment. 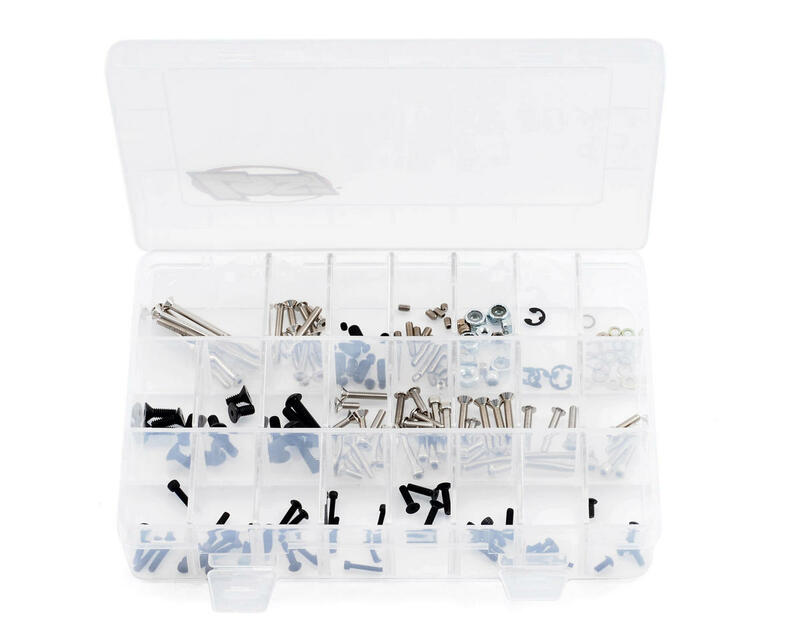 This includes a total of 175 pieces including cap screws, nuts, washers, shims, e-clips, and set screws all packaged in a divided plastic case to keep them all organized. Every 8IGHT user will find this assortment a life saver the next time they are miles from the nearest hobby shop and they loose that screw or whatever in the dirt. I purchased this kit only because I needed 1 left hand screw for lower shock mount. This kit didn’t have that screw. Money wasted in my case. Well...Some of the screws that I really need are not available in this box, kind of disappointed a bit..aside from that, the quality of the screws are quite good. Kit has come in handy a number of times. It doesnt include everything though; this weekend I lost a screw to the Ackerman plate and had to sit one vehicle out of the race. I'm not sure if there is anything else the kit doesnt have though. Great kit at a real good price! Every 8ight owner should have this in their tool box. Nice kit! Has any screw/washer/nut you could ever need for your 8ight. Excellent tray too!!! The compartment I received with mine only had three large compartments, although there is a lot of screws none of them are labeled with the size and therefore pretty much makes them useless to me.